Ah, the food truck. Is it a fad that has come and gone? 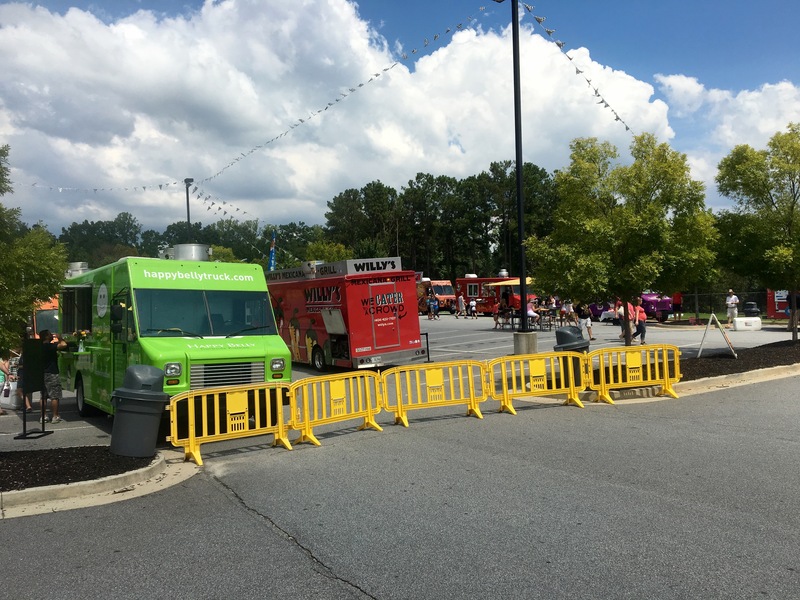 The folks who threw the first Great Southern Food Truck Rally in Kennesaw don’t think so. Join us for an extensive look at the rally as we “sweat” the details at Kennesaw State’s Sports and Entertainment Park. Thirty-six food trucks are parked on the sizzling macadam. There is little to no shade at noon and it’s hot when we arrive. Business is a bit slow at the start, but begins to pick up. 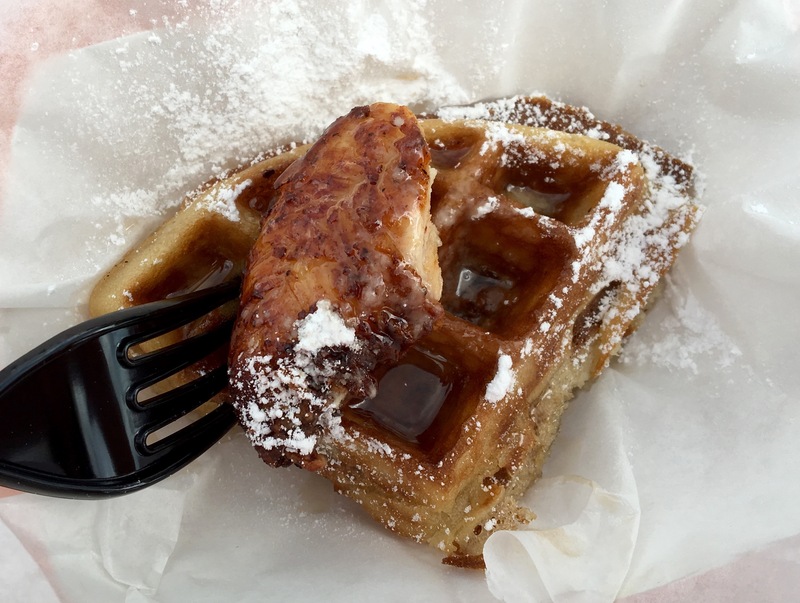 That’s good for us–no lines, which is one of the things we don’t like about food trucks. 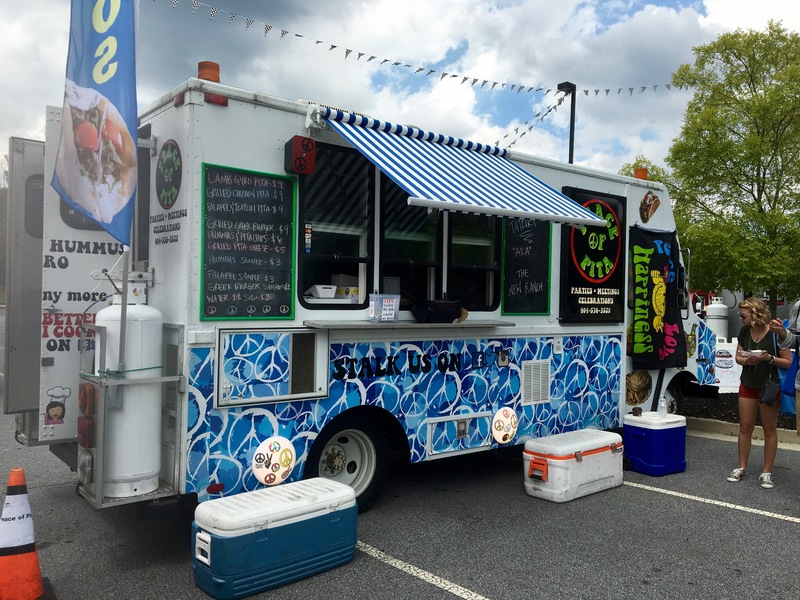 It’s hard to decide where to eat, and although some of our favorites are here (like Happy Belly), we decide to try five trucks that we have not previously sampled. Speaking of samples, many of the trucks have lower-priced samples today, which allows us to try more things. It’s sort of like the dim sum of food trucks. First up, some mac and cheese. 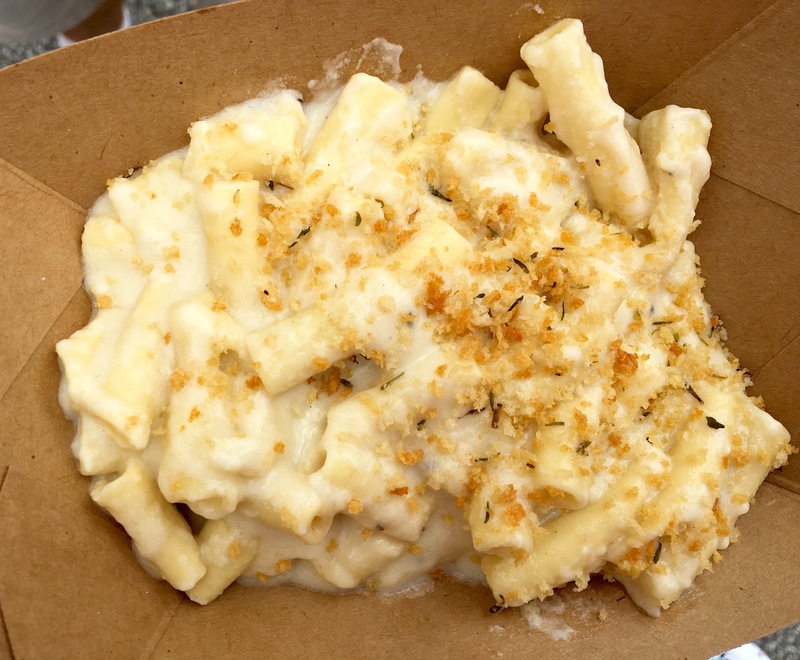 We get the $4 white mac and cheese sample from Mac the Cheese. You will read later why we are including the prices today. Eve doesn’t like this dish at all. The cheese is a bit soupy and it tastes like noodles in a cheesy sauce. Not good. 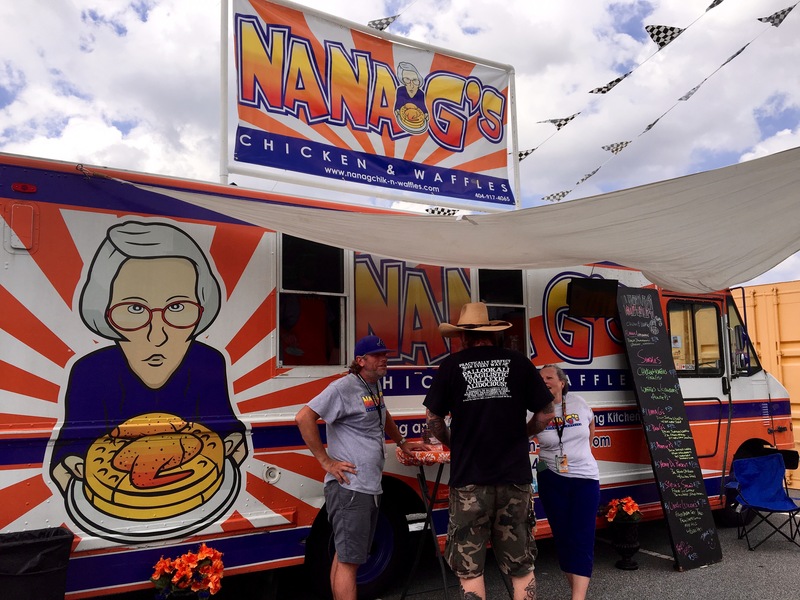 Next, we walk over two trucks to Nana G’s Chicken and Waffles. They have a $4 chicken and waffle sample. Yes, we pay four bucks for a quarter of a waffle and two bites of chicken breast. When I see it come off the truck, all I can think is, “really?” An entire order with two pieces of chicken costs $8. No value with this sample at all. However, it is the best thing we eat all day. Feeling Mediterranean, we mosey on over to the Peace of Pita truck. They are sampling falafel for $3, and we get an order. Either these weren’t cooked long enough, or someone screwed up the dough. They are soft and mushy inside instead of crisp and light. Ugh. Our friend Anna is Peruvian, so in her honor we make our next selection. You gotta like the name at least. 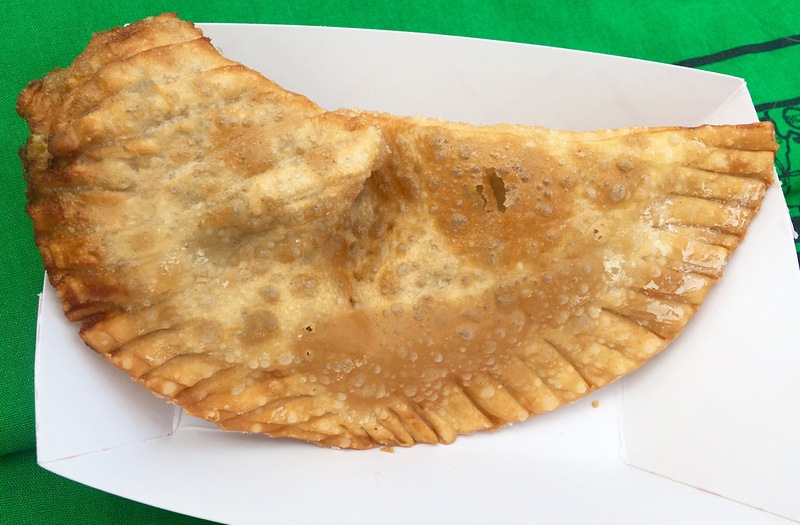 They aren’t really sampling, and we go for the $6 empanada. The crust is good, but there’s hardly any filling inside. We just paid six bucks for a fried pie pastry. What is going on here? Maybe we should have eaten at this truck. 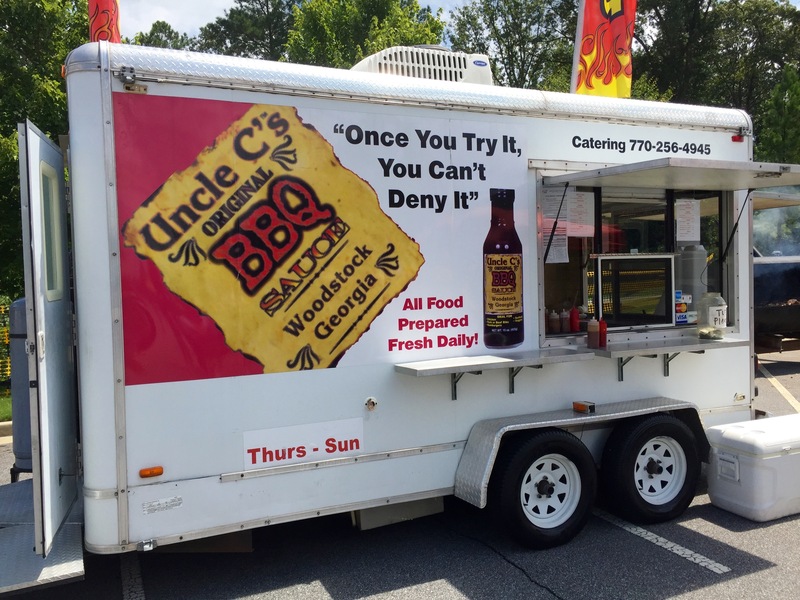 I have a nice chat with “Uncle C” and he says I can take a picture of his grill if I give him a shoutout in the blog. If only Uncle C was doing samples. That pork is gorgeous and we are too full for an entire order. We do have room for a little something sweet from Tracy’s Tasties. They have about a dozen flavors of frozen cheesecake. How about some banana pudding? It’s a pushup like you used to eat when you were a kid. For $3.50, there’s not a whole lot here either. It is good, and a nice respite from the heat for a few bites. 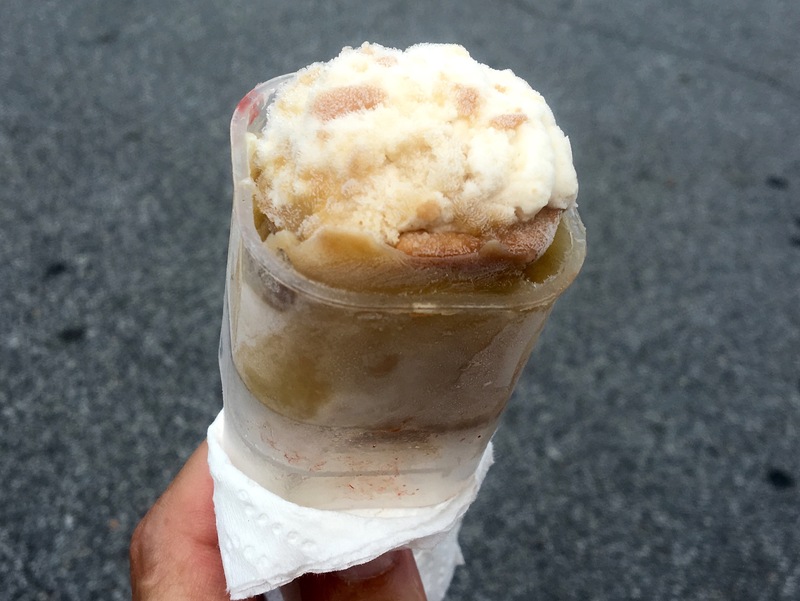 King of Pops is a few doors down, and you get a lot more for $3 there. 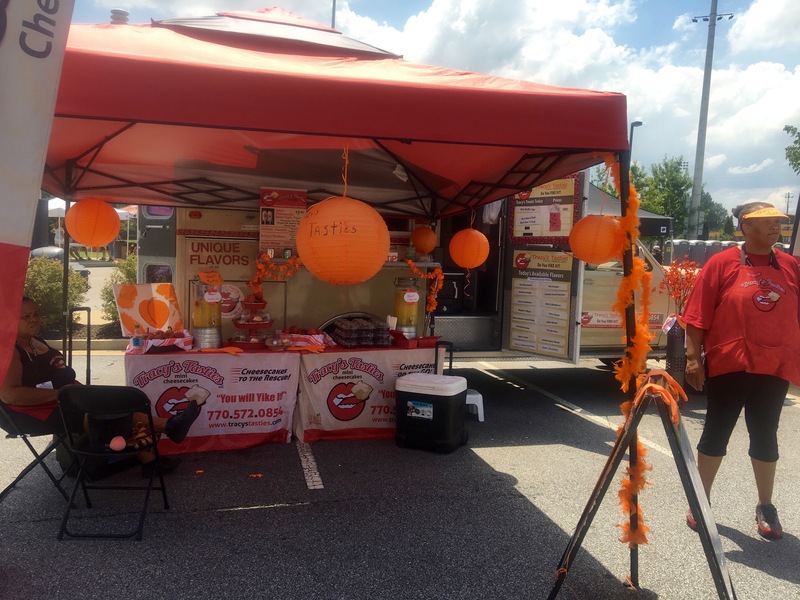 And now a message for the Atlanta food truck industry: Judging by your performance at this rally, it’s time to get your act together. Food trucks used to be a fun diversion where you could get a nice meal, eat it outside and visit with friends. 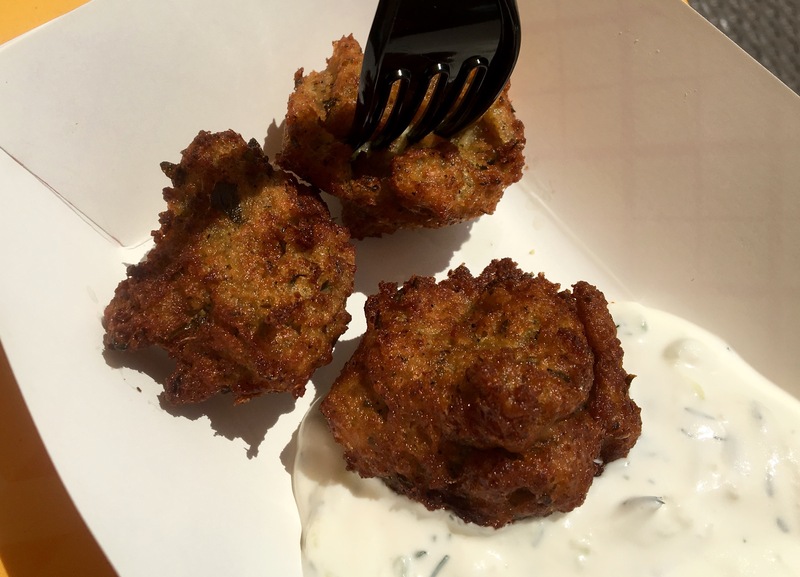 Today, we ate bad macaroni and cheese, terrible falafel, and an empanada that was a joke. The only good things we ate were two bites of chicken and waffles and a very small frozen cheesecake. 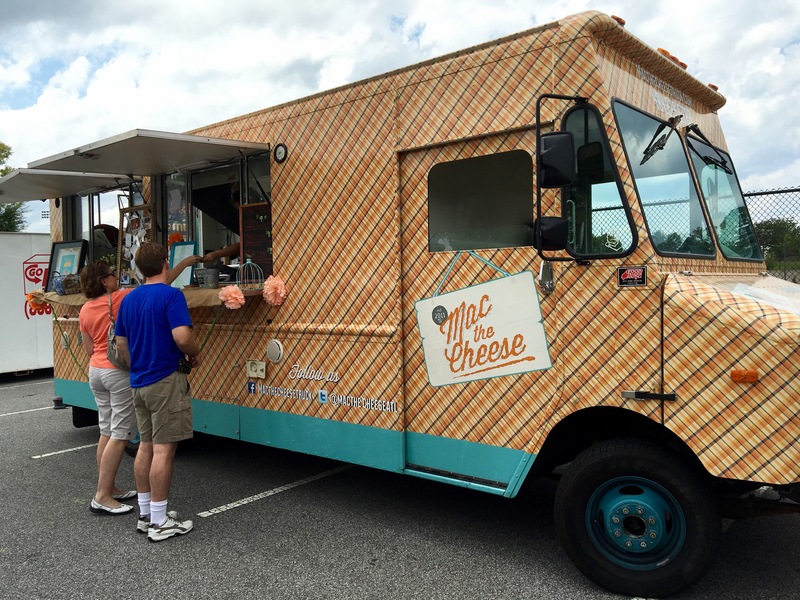 Atlanta food trucks are now expensive, and the cooking is sub-par. There’s no value here. We paid over $20 for samples that we split. Why should we ever want to eat lousy food at a truck when for the same price we can get wait service at an air conditioned restaurant? Kick it up a notch, food truck operators. Give the people a good product, or perish. So what was “hot” at the rally? Anybody that sold something cold, and there was a nice line at the French crepe truck. Other than that, it was pretty quiet. Here’s the thing: admission to the rally was $10, which severely limited attendance. The food truck owners we overheard were not happy with the admission fee. It cost a family of four $40 to get into the rally (plus $5-10 to park) and no food was included. Just live music. 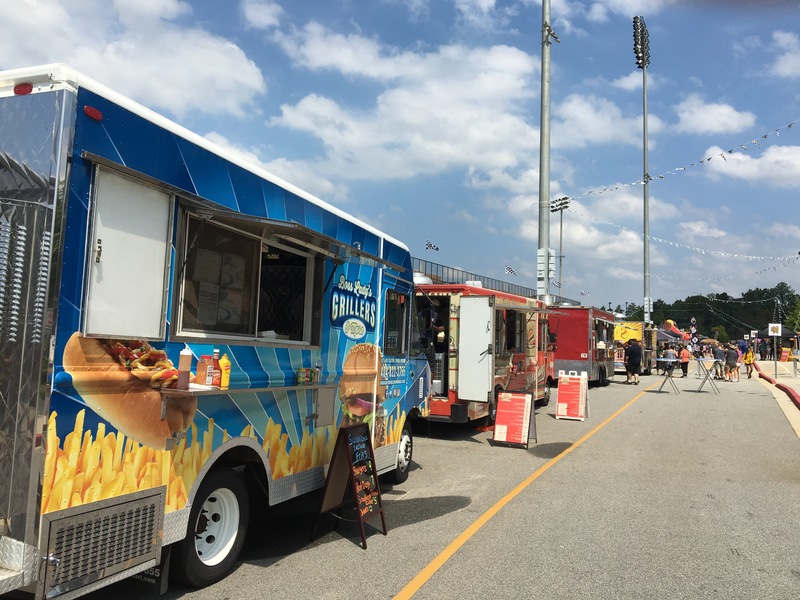 Why pay to attend when you can get ten food trucks every Monday in Marietta or Tuesday in Smyrna for free, just to name two? Organizationally, they did a good job for their first effort. The volunteers were numerous and very friendly. 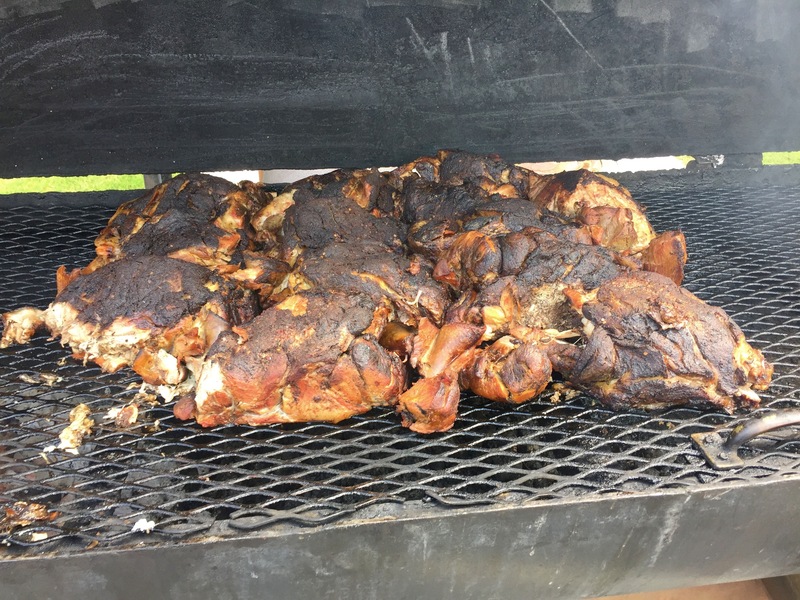 (Did you know Kennesaw State has a culinary science major? How cool is that?) Yes, they have expenses to cover and we get that, but the admission fee is going to have to go way down if this event is going to have a second edition. Note: Date Night was given complimentary media admission to the rally, saving us $20. However, we paid for all of the food from the trucks. 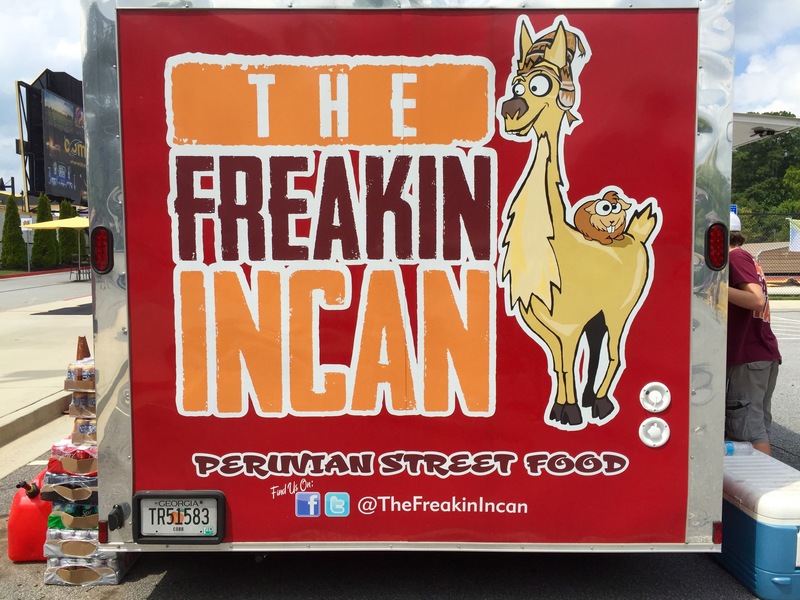 Oh, that’s sad news about the Freakin’ Incan! I’ve heard such good things about that truck, too. GG: It was not a good day food-wise in Kennesaw. Maybe the food will be better under cooler conditions! Previous Post Mezza Luna 2: A Sequel As Good As the Original?